The Japanese Pattern Challenge: Backpack Crush! Beautiful fur! Check out Bunny of La Sewista for bag-making tips. She's a pro. Wonderful stuff! I detest wearing faux fur as it feels fab but sweats and chills and all that acrylic stuff, so a bag to me is the perfect use all the fun, none of the troubles! I can't wait to see how it goes!!! I haven't used those other products you mentioned but I have used Pellon Peltex (also available at Joann's and on their website). A layer of it would be good for the bottom of your bag. I agree with you, if it seems small, make it larger. My very first backpack is just too small but the last two are perfect sizes. I'll have to check out Peltex. I'm going back to the drawing board to make it just a tad bigger. I hope you are able to get the boat finished before winter! Kyle's bags are amazing. She gives me something to aspire to. Oh I want one too! That is so fun! I can't wait to see how it looks completed and any tips you discover for working with the fur. Ikat Bag is the person to check in on. She makes bags bags bags, and has a pile of tutorials and great photos. I've used neoprene for the inside back/bottom support, and while it is a pleasure while I have the bag on my back, otherwise it's too floppy. I've got the Shapeflex for the next one, haven't cracked it yet. You might want wider back straps (those might bite your handsome coat shoulders a bit) but they are all so handsome together, you may have to just not overpack the bag. Remember to put some reinforcing in that top seam where the straps and the flap all meet. And a short carry handle across the straps will really add some usability. I've been thinking that I may wrap the webbing with a wider section of padded ultrasuede where it goes over my shoulders. I do like the idea of a handle (which the MK bag has). It certainly wouldn't be hard to work it in. I've thought about making one and so I'm eager to follow your progress, especially the materials you've chosen. So far, looks great! And good luck with the boat, too. 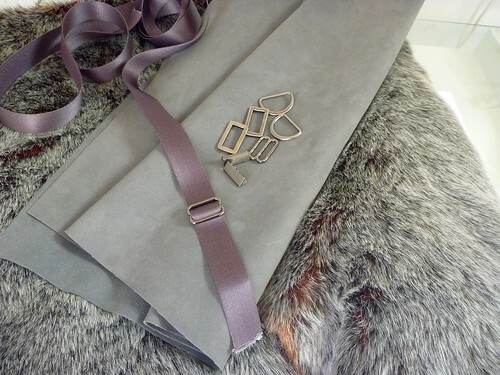 "I fell hard for this silver tipped number with a rust undercolor that's revealed when the fabric folds. I wish you could feel how deliciously soft it is. Yummy!" You have my sew envy! If yours goes well, I think I'm going to try my hand at one as well. Love the fur choice! That bag will look beautiful! Consider checking out backpacks and bags at the local Goodwill or other thrift store. Analyze how commercial bag makers construct and design their bags and use those details on your final design. Also think about reusing hardware from those thrift store bags; often they have stuff we can't get. Lastly, the weakest point of any backpack is where the straps are sewn to the pack; make sure you reinforce those areas. Good luck! This is going to be a fabulous bag. And I am just really amazed that you are making a boat. I'm just as excited to see your boat as I am to see your sewing projects! Love the fur you chose for the backpack. It's really gorgeous. Silverstorn Pour acheter votre produit doudoune cuir femme pas cher, et profiter des meilleurs prix doudoune cuir femme, doudoune fourrure femme, doudoune homme, doudoune fourrure homme, veste en cuir femme, veste en cuir homme, veste femme, veste homme. Hi, I know you've finished your backpack, but I only found your blog recently and am working back on your makes. You did say you would probably make another, so here goes. My Mother was a seamstress and worked in a Tailors in the days when fur was real, but cutting faux fur is no different. She used the old fashioned razor blades, the ones with one edge protected. You cut from the back thereby having less fur loss and mess. I also recall seeing her shave the edges, I'm not sure if this was just to reduce bulk when joining sleeves, collars etc or if she did it for all seams. 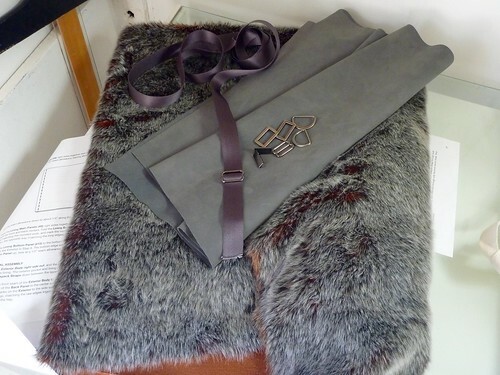 Sometimes she got to keep scraps and she made collars for coats for others, but never for herself as she didn't like fur despite working with some very expensive pelts! I recall sewing the scraps to line my wool mittens, fur side in of course to keep the fingers warm. Just before I go, I also seem to recall her using glue but I am not sure why. I'm watching your kilt with great interest. Firstly because I'm Scottish, secondly McLeod is a family name. Hi, I forgot to mention that a scalpel or similar craft tool would be much easier than the razor blade I mentioned in my comment on working with faux fur, it would definitely be easier on the fingertips and safer although I don't remember getting any cuts and I was pretty young, I think no more than 8 when I first cut and sewed the scraps to line the mittens, which was my idea as my Mum wasn't keen, but at that age I didn't understand why, although I knew she didn't like fur I was an adult before I knew she didn't approve of it as a fashion accessory but only in areas where it was a necessity!